Now that summer time is basically here many of us are finding ourselves slipping on our dusty running shoes, taking jogs and enjoying the fresh outdoors. One of my dear friends, Amanda, is in my opinion on a pro jogger. 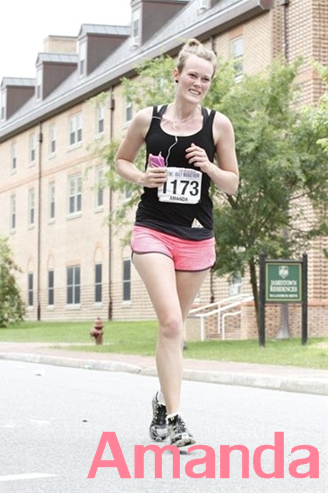 This girl runs marathons....for fun. Which to me makes her pretty much a hero! Since she's such enthusiast in this field I asked her if she's guest blog for today and share us some of her tips and tricks for looking cute while sweating it out on the sidewalks. Amanda has such a great blog about jogging and fun inspirational stories and thoughts that will keep you motivated. You should totally check out her site Girls Run Faster and send her a quick hello. I know she'd love to meet you guys. Regardless of your reasons for running, the primary goal is obviously to look cute. Perhaps this is one of the things holding you back from hitting the streets this summer and getting a good workout in? Well, I’ve worked hard to deliver some tips on looking cute while getting a good sweat! It’s really all about pink... all of my running outfits incorporate pink into them… somehow… either my super cute pink shorts from Lululemon or random tank tops from Forever21. Like the rest of my life, I always like to coordinate my clothes, and running is no exception! These shorts are my favorite because… they are like… uhhh… guys swimming shorts… so I don’t have to worry about running underwear. Ok. That was a little personal! I usually run right after work and I don’t clean my makeup off my face, so I’ve got a little mascara and eye liner on. I like to wrap my hair up in a ball on the top of my head… I hate a sweaty ponytail bouncing on my back… and I pop in some simple pearl or diamond earrings. If the sun is out, pop on some sunblock so you aren’t red from dehydration and a sunburn! Keep your hair off your face and dab the sweat so you don’t break out after your runs! I keep my toes all painted pink and run low enough mileage that I don’t have missing toenails, but I regularly take good care of my feet. Soaking them in hot water, rubbing oils and lotions and massaging them during a good movie is a regular part of my routine! If you ever notice some of your skin looking paler than the surrounding skin, read my blog entry Saving my Skin. I love running with a passion. For me, it’s the only me time I get all day! Between working full time, school and taking care of my adorable husband, my quick run is the only time my mind can be quiet. After running for about a year, I began looking into longer stints. So my husband and I signed up for our first half marathon (last march! ), and thus began the training. The most helpful guide was Hal Higdon’s half marathon training. They also have GREAT beginner training plans to prep the walker for a 5k race in 8 weeks! I’ve used and loved both these guides. I hope these ideas help you out in your quest for fitness in preparation for summer! I hope you can find the inspiration to lace up those runners, and get out the door :) That's always the toughest part, to get out the door! Good luck!